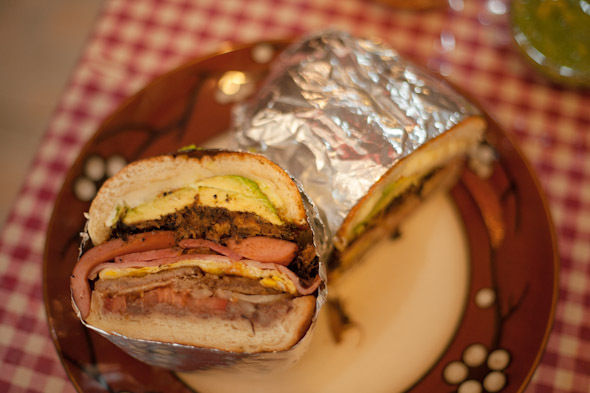 Tenoch is one of those unlikely best kept secrets many know yet few have tried. It may not even be the second place that comes to mind for a Mexican quick fix. But the taco dynasty that's still enjoying its victory lap on the menus of many of this city's finest had long been perfected by this St. Clair grill and bar when it opened a few years ago. 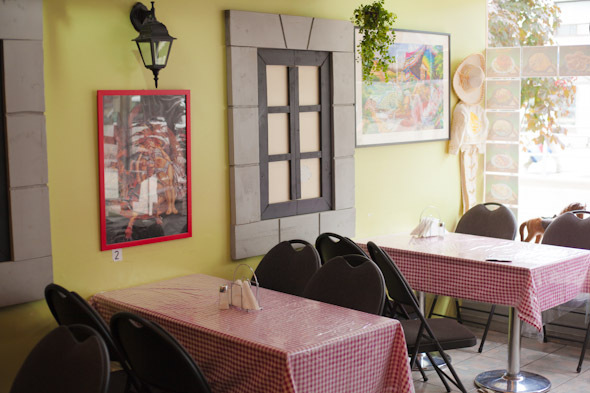 During my recent visit, I spoke to the owner, Haydee Moreno, who insists on the utmost fidelity regarding her family's finely-tuned family recipes from their native Mexico City. No Tex-Mex here, or pretension for that matter. Just casual, friendly dining and authentic flavours. In lieu of certain ingredients some creativity is required, I'm told, but the results are the closest you'll get to real Mexican cookery. I don't doubt it. A mango jarritas ($2.50) in hand to quench my thirst, the pork taco carnitas ($8 for 3, or $11.50 for 5) were as good as any usually name-dropped around town, but cheaper and more plentiful. 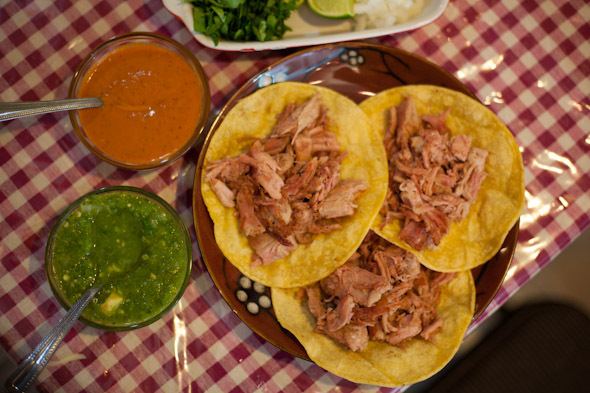 You get a sturdy helping of slow-cooked tender pork, cilantro and diced onion on fresh corn tortillas, simple as that. A healthy spray of lime and a few spoonfuls of their lime-green jalapeno or spicy red arbol salsa and you're all set. Cleansing and tingling, you'll wish you could bottle up that heat long after the meal's over. Other tacos to try next time will be their sausage and potato chorizo con papas, or their alambre tacos stuffed with a fetching mixture of shredded steak, onion, seasonal peppers, ham, bacon and cheese. What came next was the main event. I had heard fevered rumours of Tenoch's torta sandwich ($13), but had to satisfy that curiosity with my own eyes and mouth, clichĂŠd as that might sound. Needless to say, photos barely register its formidable magnitude. Nor could my spatial reasoning number crunch the logistics of eating it in its entirety (I could only manage half in one sitting). Almost regulation football-size in terms of volume, but denser and heavier, this meaty vessel practically occupies its own zip code and by that I mean, an oath to destroy all zippers in its wake. 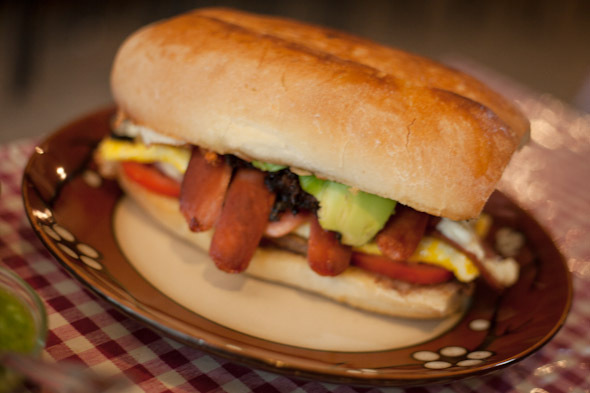 A roundup of the Tenoch torta gang could confirm just such suspicions: milanesa breaded steak, pierna roasted chipotle pork, pastrami, ham, and hot dogs...not to mention tomato, onion, cheese, refried beans, avocado, and a fried egg. Wrapped up in foil, it held together, believe it or not, no leaky fissures in its silver hull. This was helped in part I'm sure by the hefty yet soft bun which thankfully never got soggy. Even more remarkable was that the leftovers pretty much held intact. In retrospect, though, I'd say it's best for sharing. Two main specials spice up their regular rotation. 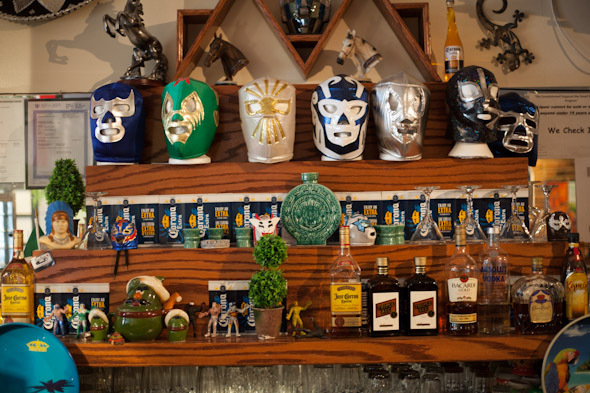 On Fridays they serve a traditional pork and corn grit pozole and a barbacoa lamb dish on Sundays. Both daily features come with a side of crispy tortillas, shredded lettuce, onion, radish, and lime, with the exception of the barbacoa which also comes with consommĂŠ. 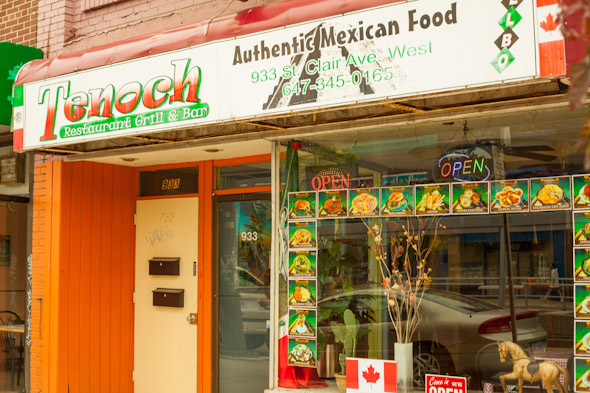 The impressive menu variety being one of their strong points, take-out from Tenoch seems like it would be a no-brainer. But if you stop by weekends, busy as theirs are, you might leave disappointed unless you order well in advance. If takeout's your bag, weekdays are your best bet, but again, do expect reasonable, but still longer than average wait times since everything's prepared lovingly from scratch. In the not-too-distant future this may be a non-issue as there's been talk about opening a take-out only location nearby.